Who invented the Dishwasher? 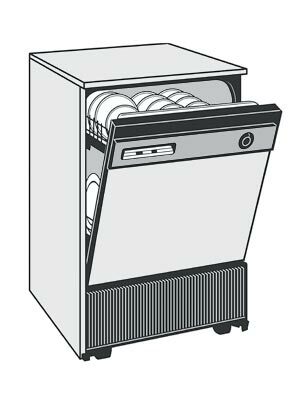 The name of the person credited with inventing the mechanical Dishwasher is Josephine Cochran (1839 - 1913). Josephine Cochran is not only famous as the American inventor of the Dishwasher but also as a business woman and entrepreneur. When was the Dishwasher invented? Josephine Cochran invented the first reliable hand-powered Dishwasher in 1887 and the Walker brothers of Philadelphia produced the first electric dishwasher in 1930. Definition of the Dishwasher: The Dishwasher is defined as a dishwasher is a mechanical device for cleaning dishes and cutlery. The mechanical dishwasher cleaned dishes and kitchen utensils by spraying them with a mixture of water and detergent that was circulated by a pump. Water is pumped to one or more rotating spray arms, which blast the dishes with the cleaning mixture. Once the wash was finished, the dirty water was drained and then rinsed with clean water. Fact 1: Who invented the Dishwasher? The Dishwasher was invented by Josephine Cochran in 1887 during the Second US Industrial Revolution era of inventions (1850 - 1914). Fact 2: Who invented the Dishwasher? Prior to the invention of the Dishwasher in 1887, hand-powered dishwashing machines were invented by Joel Houghton in 1850 and L.A. Alexander in 1865. Both of these dishwashing machines proved to be unreliable and slow to use. The only alternative was to wash dishes by hand. Fact 3: Who invented the Dishwasher? The inventor of the first reliable hand-powered dishwasher. It was the first dishwasher to use water pressure rather than scrubbers to wash and clean the dishes inside the machine. Fact 5: Who invented the Dishwasher? Josephine Cochran was born Josephine Garis on March 8, 1839. The early years of Josephine were spent in Ashtabula County, Ohio, United States where she was raised by his family. Her father was John Garis, a civil engineer, and her mother's name was Irene Fitch Garis. Josephine Garis Cochran had one sister called Irene Garis. Fact 6: Who invented the Dishwasher? Josephine Cochran was educated at excellent home education and gained an interest in new technology and mechanical engineering from her father. Fact 7: Who invented the Dishwasher? Josephine Cochran received a good education at a private school and the family were connected. The flair for creating inventions ran in the family and her maternal grandfather was John Fitch who was an early pioneer of the steamboat. Fact 8: Who invented the Dishwasher? Following her education and graduation Josephine moved in with her sister Irene who had settled Shelbyville, Illinois. Fact 9: Who invented the Dishwasher? At age 19 Josephine married 27 year old William Cochran who became a wealthy merchant and investor. The couple lived in a large mansion with servants and a comfortable lifestyle as William became a rising star in the Democratic Party. Fact 10: Who invented the Dishwasher? An independent woman and an early feminist, she assumed her husband’s name but preferred spelling Cochran with an "e" on the end, much to the annoyance of the Cochran family. Fact 11: Who invented the Dishwasher? The couple went on to have a son called Hallie who sadly died in infancy and a daughter called Katharine. Fact 12: Who invented the Dishwasher? Josephine Cochrane was a member of the social elite and supervised many dinner parties at the mansion. She took great pride in displaying and using the valuable, heirloom china which apparently dated back to the 1600's. Providing entertainment was a common occurrence in the Cochrane mansion and was no problem for the confident and sophisticated Josephine Cochrane and she had servants who undertake the chores required after such parties, which of course included washing the dishes. Fact 13: Who invented the Dishwasher? After one such event Josephine Cochrane was furious to discover that some of her precious china dinner service had been carelessly chipped by the servants. Josephine was so annoyed that she vowed she would never allow her servants to clean the fine china dishes again. Despite this unpleasant task she refused to give in and found herself regularly washing up at the kitchen sink. Fact 14: Who invented the Dishwasher? It was these events that led Josephine Cochrane's invention of the Dishwasher. It was 1883 during the period known as the Industrial Revolution when various labor saving, useful household devices had already been invented such as the the Refrigerator, the iron, the Phonograph and the Telephone. Even the first Car had been invented - but no one had invented a reliable, mechanical dishwasher. Fact 15: Who invented the Dishwasher? Josephine Cochrane decided that she would invent a dishwasher. She was intelligent, well educated and had inherited an understanding of mechanics from her father. Her basic idea for the invention of a dishwasher was a device that held the dishes securely in a rack, as the pressure of spraying water cleaned the dirty dishes. Fact 16: Who invented the Dishwasher? Josephine Cochrane was excited by her ideas for the invention of a Dishwasher but her enthusiasm was cut short when her alcoholic husband died in 1883, shortly after she had first thought of her idea. Despite having all the trappings of wealth it turned out that her husband was deeply in debt. Fact 17: Who invented the Dishwasher? Josephine Cochrane was motivated to produce and market a reliable dishwasher as a way of easing her financial burdens. It was extremely unusual for a woman to become involved in inventions and practically unheard of for a woman to design a mechanical device. She went to various mechanics to show them the plans for her device but she, and her idea, was treated with great disdain. The attitude of me at the time was a "woman's place is in the home". Fact 18: Who invented the Dishwasher? The determined Josephine Cochrane flouted convention and continued her search for someone to help her with the construction of the dishwasher. She then met George Butters, a local mechanic employed by the Illinois Central Railroad, and hired him to work part-time on creating a mechanical dishwasher from her designs. Fact 19: Who invented the Dishwasher? Josephine Cochrane with the help of George Butters built a dishwasher in a shed behind her home. The dishwasher design featured a wire rack with compartments for loading various, different shaped dishes, that was placed inside a wheel on a copper boiler. A motor turned the wheel whilst hot, soapy water sprayed from the bottom of the boiler on to the dishes. Fact 20: Who invented the Dishwasher? Josephine Cochrane immediately installed the device in her kitchen. It was a reliable, labor saving machine that would appeal to all women who had to wash dishes. Fact 21: Who invented the Dishwasher? She received her first patent on the Garis-Cochran Dish-Washing Machine on December 28, 1886. Fact 22: Who invented the Dishwasher? Inventing and building the Dishwasher was one thing, bring the product to market and selling the device was quite another. There was not the interest for such a device by ordinary housewives. Anyone who could afford such a machine already had servants who did the work for them. Fact 23: Who invented the Dishwasher? Josephine Cochrane then realized that potential customers might be the owners of hotels or restaurants. After meeting with considerable prejudice from a world dominated by men Josephine Cochrane eventually sold her first dishwashers to the Palmer House hotel and then the Sherman House hotel in Chicago. Both were delighted with the new product and gave her recommendations for her product. Fact 24: Who invented the Dishwasher? As luck would have it her new invention of the dishwasher coincided with an important event to be held in Chicago. It was the 1893 World's Columbian Exposition, aka the Chicago World's Fair and Josephine Cochrane grabbed the opportunity to display her invention and hopefully get some orders for her dishwasher. Fact 25: Who invented the Dishwasher? Josephine Cochrane and George Butters set up their invention as an exhibit in Machinery Hall at the 1893 Chicago World's Fair. The dishwasher attracted significant interest and Josephine Cochrane received orders from other hotels and some restaurants for her innovative device that was reliable, durable and adaptable. Fact 26: Who invented the Dishwasher? The success of the dishwasher at Chicago World's Fair led to Josephine Cochrane to establish the Garis-Cochran Dish-Washing Machine Company in an abandoned schoolhouse in 1897. George Butters left his job at the railroad and became factory foreman and chief mechanic. Fact 27: Who invented the Dishwasher? The product was a great success and the use of the dishwasher was extended to hospitals and colleges. A lack of indoor plumbing meant that only wealthy people owned dishwashers and they remained a luxury item until well into the 1950's. Fact 28: Who invented the Dishwasher? Josephine Cochrane died on August 14, 1913 and will be remembered in history as the independent woman who invented the dishwasher. Fact 29: Who invented the Dishwasher? After the death of Josephine Cochrane her company was purchased by The Hobart Manufacturing Company. Hobart went on to manufacture dishwashers in 1949 under the KitchenAid brand, which is now owned by Whirlpool.